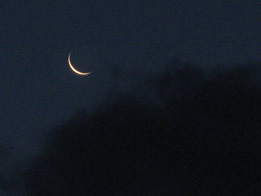 Look at this picture and tell me if the moon is Waxing or Waning. The phase of the moon affects the earth and water. It also makes a difference in the garden and the forest. This is not just folklore. It is something every farmer, and fine wood craftsman knows. The moon waxes and wanes. Waxing is the time the moon is growing toward being full. Waning is the time the moon shrinks from full to nothing. The easiest way to tell if the moon is waxing or waning is the DOC method. Look up at the moon in the sky. Now, go back to the picture, at the top of the page, and tell me what phase the moon is in. If you weren’t able to tell before, you should be able to tell now.